It has been a busy and productive semester for the Canavan Group. Students from Prof. Heather Canavan’s group recently won the “Keep it Cool” Challenge sponsored by Dion’s, a local pizza chain . Dion’s, which has been an Albuquerque favorite for more than 25 years, recently introduced a new addition to its popular salad dressings: green chile ranch dressing. The salad dressings are so popular that Dion’s sells bottles of dressing for home use. However, former Burqueños living out of the state have been unable to try the new dressing, due to Dion’s inability to keep their dressings cold for a reasonable cost. The UNM innovation Academy (iA) and STC.UNM recently co-hosted the Dion’s “Keep it Cool” Challenge, which had one aim: design a low-cost method (<$10) to keep salad dressing at <5 C for 48-72 hours. The winning team included undergraduate and graduate students from the Biology and Chemical & Biological Engineering Departments: Phuong Nguyen, Tye Martin, Ben Matheson, and Johnny Yarmey (PhD students in the Biomedical Engineering grad program), as well as Darnell Cuylear (BS student in the Biology department). At this year’s Shared Knowledge Conference, four of the final eleven presenters in the “LoboBITES” competition are from the Biomedical Engineering graduate program. Phuong Nguyen, Tye Martin, and Adeline Fanni presented the PhD dissertation research they are pursuing in the groups of Profs. Heather Canavan (Nguyen and Martin) and Eva Chi (Martin and Fanni). Emma Garcia is presenting research from her masters project working with Prof. Christina Salas. According to Prof. Canavan, this is the first time that students from this relatively new graduate program have presented in the competition. In October, Prof. Heather Canavan was made a Fellow of the AVS society, for her innovative and sustained contributions to the understanding of stimulus-responsive materials, such as bioactive polymers. That same night, a graduate student in Canavan’s group, Ms. Phuong Nguyen, was awarded the Dorothy and Earl Hoffman Award in the society for her outstanding research using stimulus-responsive polymers to improve patient experiences to prevent colorectal cancer. Canavan’s award also acknowledged her outstanding efforts "leading transformative, innovation-focused educational platforms that encourage women and underrepresented minority student participation in STEM fields.” She reflected on the fact that her award recognizes both educational and research contributions by saying “I couldn’t do one without the other. It was Phuong’s Vietnamese heritage that provided the spark to transform the unpleasant experiences that patients have drinking GI prep liquids into a more palatable “bubble tea” experience. I wouldn’t have had that inspiration without her. I’ve been fortunate to work with so many talented young people over my 15 year career at UNM, and they’ve all influenced our research with their backgrounds and skills. So I see this award as a recognition of their hard work, too." At the same award ceremony, Canavan’s postdoc advisor was presented with the Medard Welch award, the highest award presented by the society. In attendance at the award ceremony were his wife, colleagues, and many former students—and in the case of Phuong Nguyen, his ‘academic grandchild’.” After the award ceremony, Canavan said “I am grateful to the AVS for recognizing my work with this commendation. But it is even more special that I got to share the spotlight with my postdoctoral advisor and student who were also recognized, as well. It was a great honor." 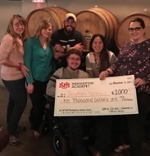 November 5th, Bow & Arrow Brewery hosted the 3rd Lobo Rainforest Student Pitch competition, showcasing the efforts of students in New Mexico’s universities who are pursuing entrepreneurial research. Students and faculty from the School of Engineering have participated since the first cohort in fall 2017, gaining insight and perspective into bringing products to market from business mentors provided through STC.UNM and the UNM innovation Academy. However, the students have learned much more. According to 2 time participant Ben Matheson, participating in I-Corps gives the students the feeling of true ownership over their projects, including the $3,000 budget for their projects. One of the most exciting aspects of the program is the students’ chance to pitch their ideas to a packed audience of judges at venues such as Bow & Arrow, which was packed with excited family members and friends who gathered to support their friends. 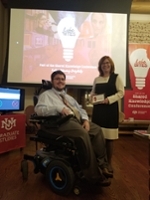 Johnny Yarmey, a new graduate student in the Biomedical Engineering graduate program, presented an idea that came from his experience as a paramedic, and Navy veteran. Citing difficulties that first responders have in re-establishing airways for unconscious patients, Yarmey has designed a new method to intubate patients that will be gentler on patients, as well as the paramedics who treat them.